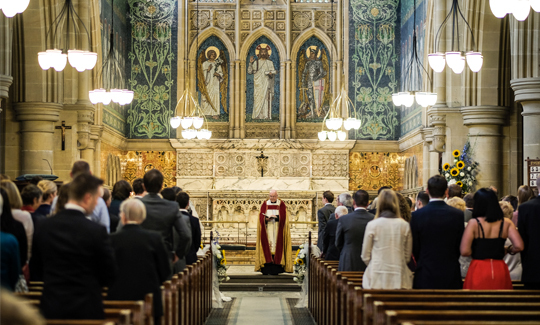 To arrange to discuss Baptisms, Weddings or Funerals with one of the clergy, phone, email or drop into the Parish Office on weekdays, 9.30am-12.30pm to fix a time to talk. We welcome adults or children for baptism (if you aren’t sure if you qualify, just ask!). During the christening your child will be baptized. It’s the first step of an amazing journey with God, which for a child includes their parents, godparents, friends, and family as well as the church community. You don’t have to have been christened yourself, and you don’t have to have been a regular churchgoer. It is free, and usually takes place in the 9.30 service on the second Sunday of the month. 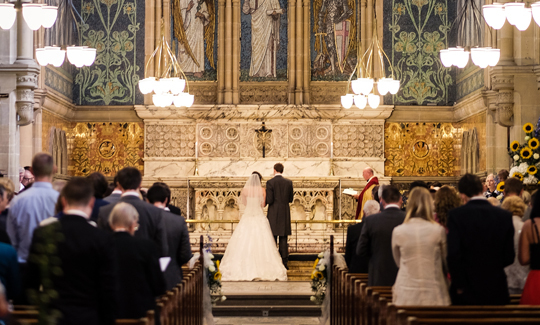 Many couples get married at St George’s each year. Whilst some live in the parish, others have one of several legal ‘qualifying connections’. Just email, phone or pop in to the Parish Office to make arrangements to discuss whether you might fit one of these. We can offer a warm welcome, a stunning building, exquisite flowers, excellent music and work with you to create a meaningful and beautiful service for your marriage. Losing someone you love is difficult. Each person is unique in so many ways. We can help you to plan a service, whether in our church or elsewhere, that will allow you to give thanks for the particular person you knew and loved in a way that provides comfort and hope. We also welcome you to come and pray, or to light a candle, or to join us at any of our services.